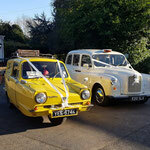 Our Wedding Taxis or quirky and original wedding car solution for brides & grooms. 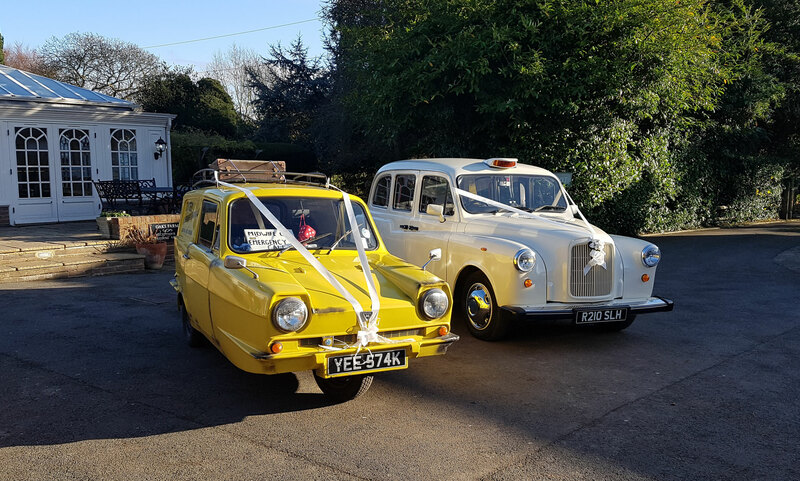 Perfect if you are looking for something a little different from the usual old wedding cars, desire an iconic vehicle or just want a little more space when you travel? Simply known and loved as the trusty Black Cab, White London Taxis iconic restored London cabs are available exclusively as wedding cars. 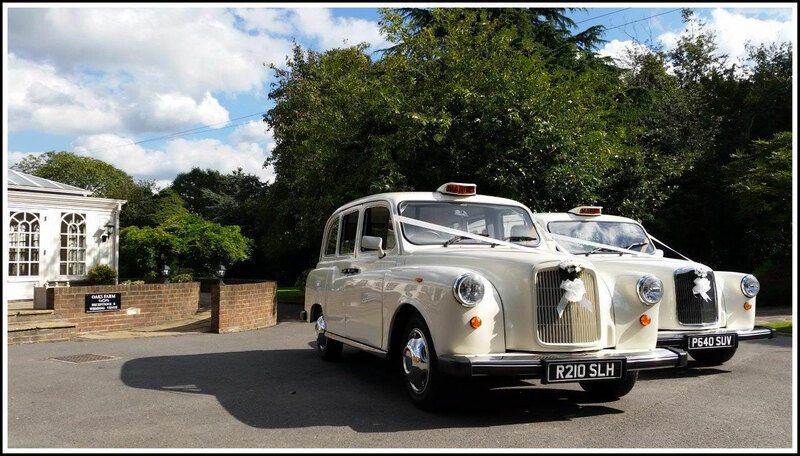 From the colour of the cabs ribbons, floral decorations to carefully planned routes and pick up times, we will work with you to make sure everything is flawless. With a decade of experience and hundreds of successful weddings, White London Taxis chauffeur driven wedding taxis make truly unique bridal cars and bridesmaids cars. Whether you are still in the early stages of planning a wedding, trying to establish costs or ready to book, help is at hand. 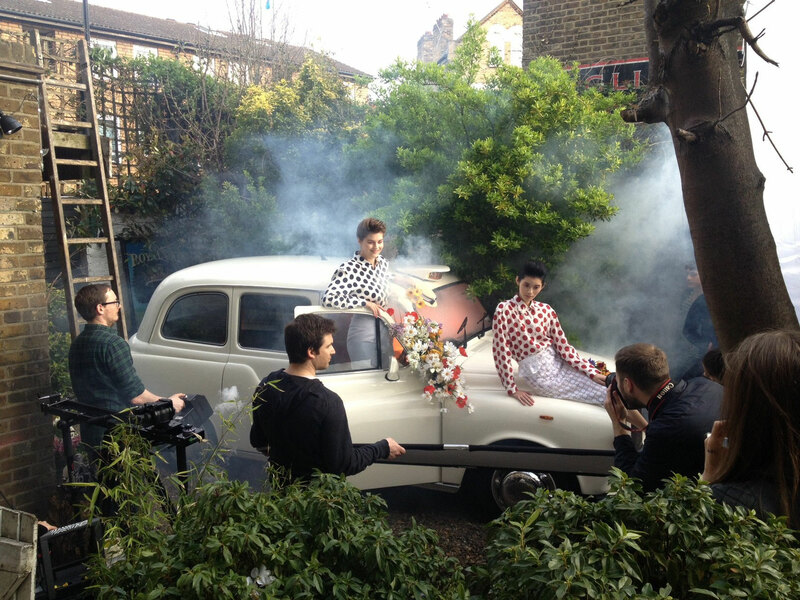 The traditional FX4 Fairway Taxis (featured at the top of this page), come with classic 1960's looks and curves. They have been restored inside and out, sound proofed for extra comfort and trimmed in dove grey leather. Even their roof top hire signs, now illuminate "married". 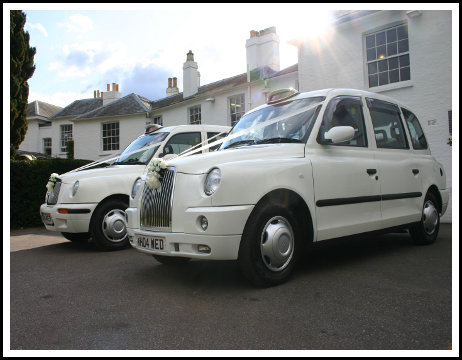 Retaining the classic lines of the traditional London Cab, but with a more modern look and ride. These modern TX versions (featured here) are a very popular bridal cars and with their larger passenger area a great choice as a bridesmaids car. Rear passengers were no afterthought in the Black Cabs design, they were its sole purpose. So no having to squeeze through any tiny rear passenger doors. 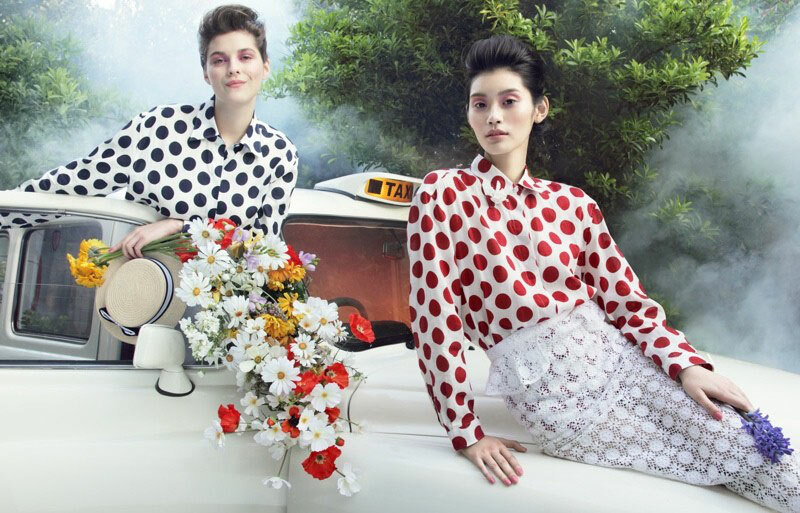 With a large passenger area, both you and your dress have even more leg room than a 1st class airline seat. 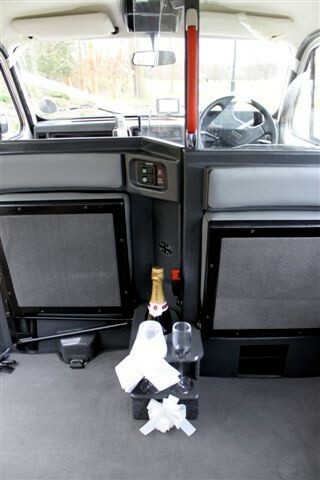 Not only does this make for a totally wedding dress friendly vehicle, with plenty of headroom and handles to support yourself, a graceful exit comes with ease. With face to face seating, your wedding party won't feel excluded on the journey or have to talk over their shoulder. 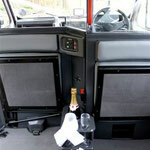 The seating layout allows bridesmaids or family members to chat to each other with ease on the journey. 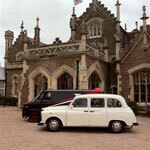 It's this seasons wedding must have, it's our London taxi photo booth. Wedding photo booths are great guest entertainment and also a chance to capture some truly unique wedding photos. 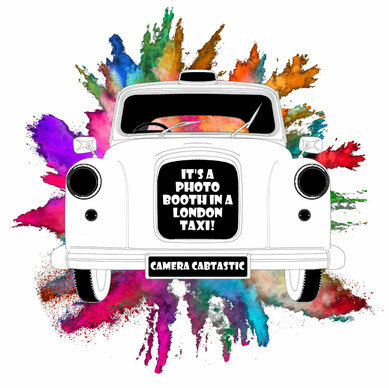 If you want something fun and original at your wedding, they don't come more funky than our photo booth cab. Its 100% photo booth, gives instant prints, saves all the nights images and it even records video messages from guests. Camera Cabtastic comes complete with fun props box, unlimited visits, touch screen controls and helpful photo booth attendant. All your guests need to worry about is, what prop to choose and pose to strike! 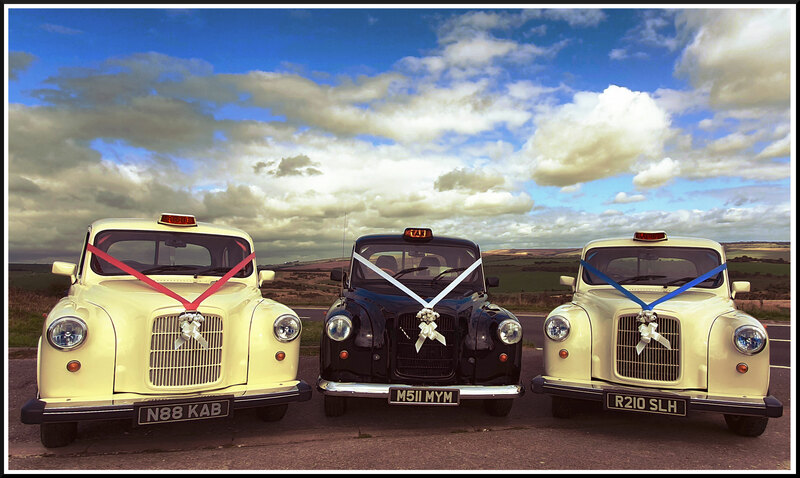 We can even offer a service where your Classic Taxi wedding car can be converted on site to a photo booth for the evening guests to enjoy. 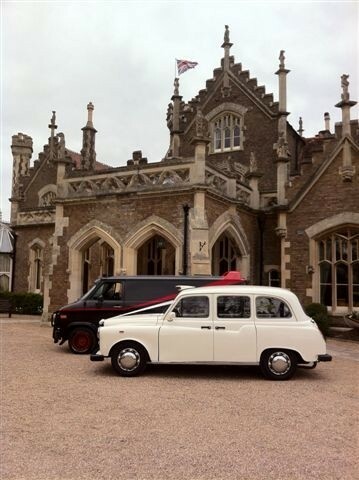 Our Wedding Cars Cover Sussex, Surrey & South London Including: Brighton, Burgess Hill, East Grinstead, Croydon, Crawley, Epsom, Ewell, Guildford, Horsham, Kingston, Leatherhead, Oxted, Putney, Redhill, Reigate, Richmond Park, Sutton, Uckfield & Wimbledon.